Speaking to Maarten Ten Holter of Vripack, he's keen to stress that the 26.8m Bandido 90 Little Blue will be on display at the upcoming Cannes Boat Show, 9 to 14 September. Built by Jade Yachts in 2007, she sleeps six guests in a master and two doubles and Maarten says, "If you have a client looking for a massive tri-deck full displacement motoryacht in new condition, this is the one." 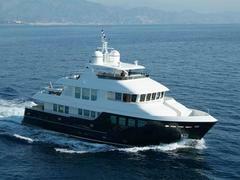 Her asking price is €5.4 million (VAT paid) and apparently her owner is very motivated and looking for offers.